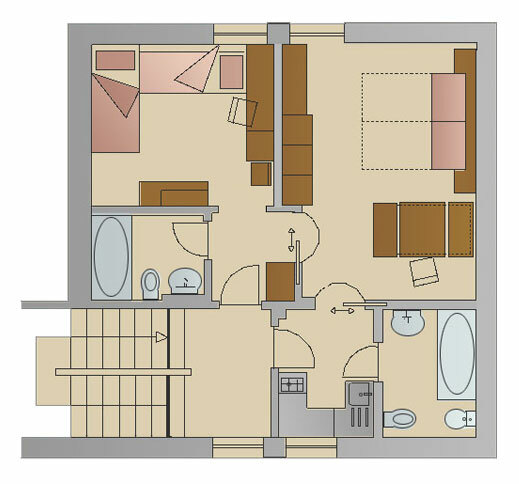 The Apartment 01 offers two rooms. A very comfortable living room with a nice pull out double bed, a comfortable corner bench, satellite TV and Internet connection, a bedroom with two single beds, satellite TV, bathroom, shower, WC and hairdryer and a second bathroom with bathroom, shower, WC, hairdryer and bidet. The apartment has a fully equipped kitchen with a dishwasher and provides a free-to-use parking place in the garage. 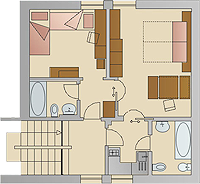 You will certainly be very happy that you have a beautiful view over the mountains of Val Gardena from your apartment. New: Free ADSL wireless network connection in every apartment. Free use of the washroom! For your information: If you do not bring your own towels, we can provide towels at a fee of 10 € per person and week. The apartment can be rented for the whole season!